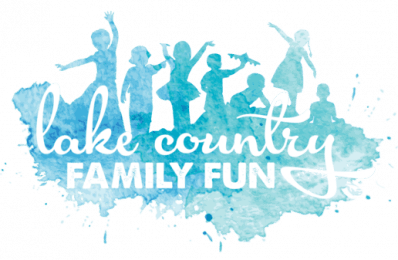 For the last few years, it’s been a family goal (okay, a personal goal) to visit all of the Waukesha County Parks in one year. We’ve lived in the area for about ten years and tend to visit the same parks. Our kids are now teens and we realize they will be off to college very soon. So 2017 is the year! We’ve been using this list as a guide. As 2017 draws to a close, we have visited 9 of the 11 parks on the list so far. With two available weekends in our family’s schedule left in 2017, we headed to Eble Ice Arena at 19400 W. Bluemound Road, Brookfield, WI 53045. *They do not have skate aids. Double bladed skates and chairs on the ice are not allowed. Their hours vary by season. 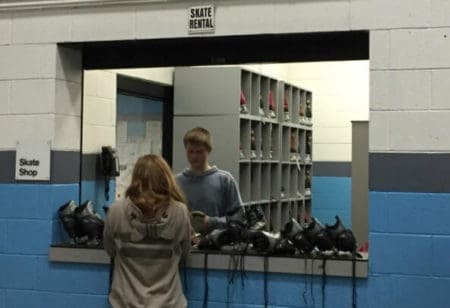 They have a few hours each day available for public skating, so be sure to visit their website for hours or call their public skate like at (262) 784-5155. One reason we have pushed off the ice rinks until the very end is that we’re just not big ice skaters. But part of this 2017 Waukesha County Park-a-palooza is to get out and try new things. My husband was afraid he would fall and break something. Since we didn’t want him to break anything, the kids and I channeled our inner Apollo Ohno and circled the rink in our rented skates. We are confident that all members of the Olympic figure skating, speed skating, and ice hockey teams all had humble ice beginnings. Granted, they were probably 12 months when they got their start at one point on the ice. Okay, so they were probably on the ice from 12 months, but the Fujimoto Four are not Olympic ice skaters. The Fujimoto Four, minus one who didn’t want to break anything and minus the other one who has enough ice skating muscle memory that ice skating is like riding a bike, are wall huggers! Thank goodness for the wall, because it took a few laps before the kids felt confident enough to let go. Whether they were hanging on to the wall or not, they were sure to give dad a wave each time they passed. I made sure to encourage all wall huggers along the way whether we were related or not. 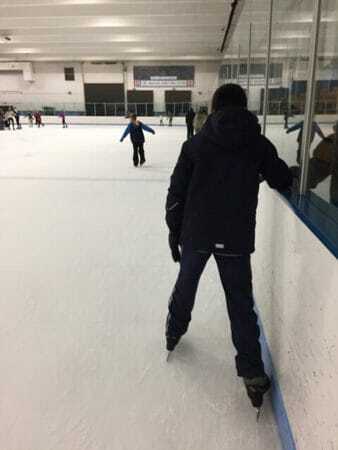 Besides the aforementioned wall huggers, the ice rink hosted a variety skaters during public skate. We saw teens, a very young hockey player in uniform, parents encouraging their young skaters on the ice, and parents encouraging their skaters from the stands. One skater seemed to be receiving lessons in the middle of the rink. 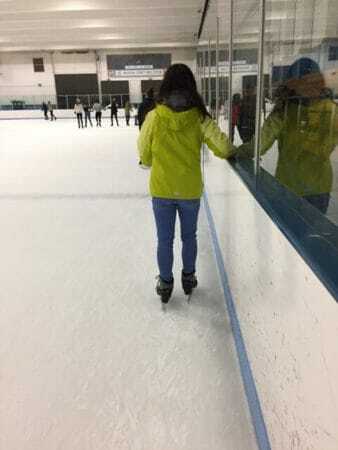 We saw other skaters circling who had enough finesse and grace that made us think they too were figure skaters. 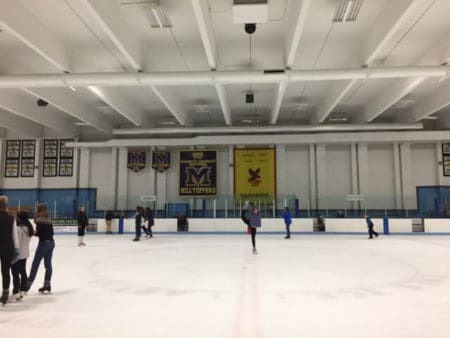 The rink is used for community and high school ice hockey teams (not during public skate) and their banners hang proudly around the rink. 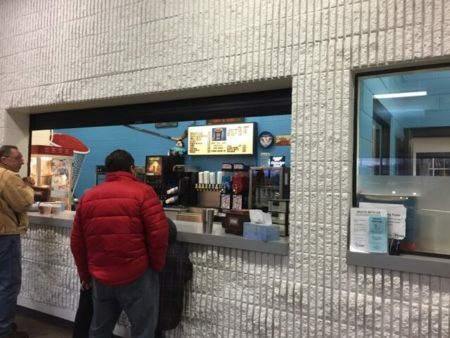 The snack bar is where you pay for your entrance fees and where you can fuel up with a variety of munchies. You’ll see this area as you enter the building, and this area is also where you will find the restrooms. After public skating hours are done, the Zamboni comes out to resurface the ice for the next group. Not sure what it is about this machine that fascinates me, but these are so cool. No pun intended. We ended our skating time with the obligatory Zamboni watching. 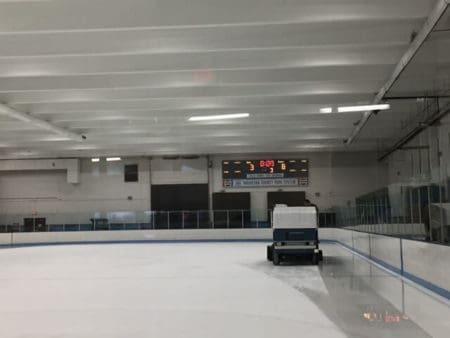 I hope the Zamboni driver feels an amazing sense of satisfaction upon seeing the ice transformed into a glistening sheet of ice when he has the rink to himself. In a few minutes, the ice goes from frosty to glistening. In a few more minutes, the glistening ice hosts new skaters who will turn it back to a frosty sheet of ice. 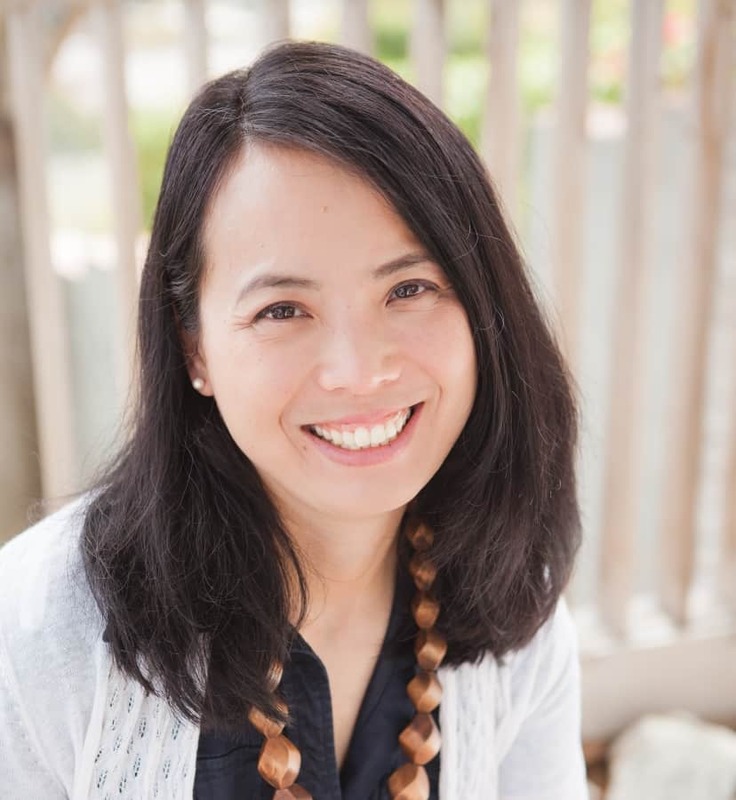 The work may seem thankless because in a few minutes, all of that work seems to have disappeared. It’s like me and a tidy house. It really doesn’t last long, but for those few moments, I take it all in and enjoy the calm. So here’s to Zamboni drivers and moms who tidy their houses everywhere! While it took a while to get the skates on, it did not take very long to get the skates off. 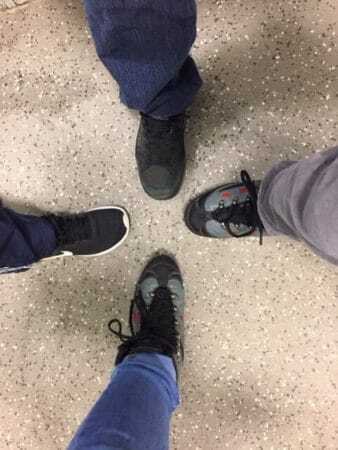 So fast, we’re half shoes and half skates. Ten down, one to go! 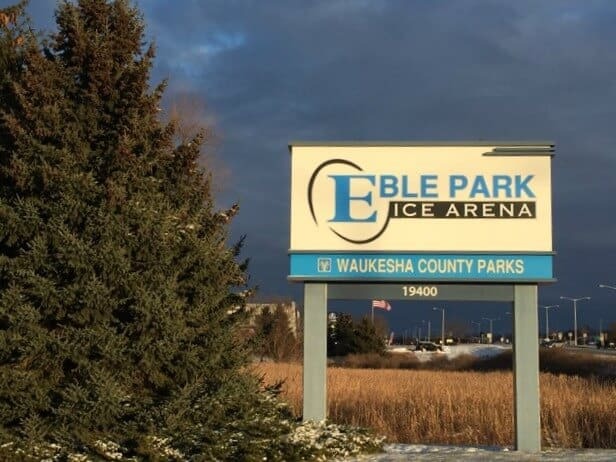 We are looking forward to wrapping our 2017 Waukesha County park adventures at Naga-Waukee Ice Arena.